The yarn is dyed by hand in large VATs, according to decades old recipes, and based on the patterns scheduled to be made. This is a way of eliminating waste by dyeing only the colours required. You can see the bamboo poles resting on the edges of the baths with the yarn having been deeply saturated. The process of yarn dyeing as opposed to piece dyeing offers a saturation of hue and colour fastness that can’t be matched doing it any other way. This takes up to a week. 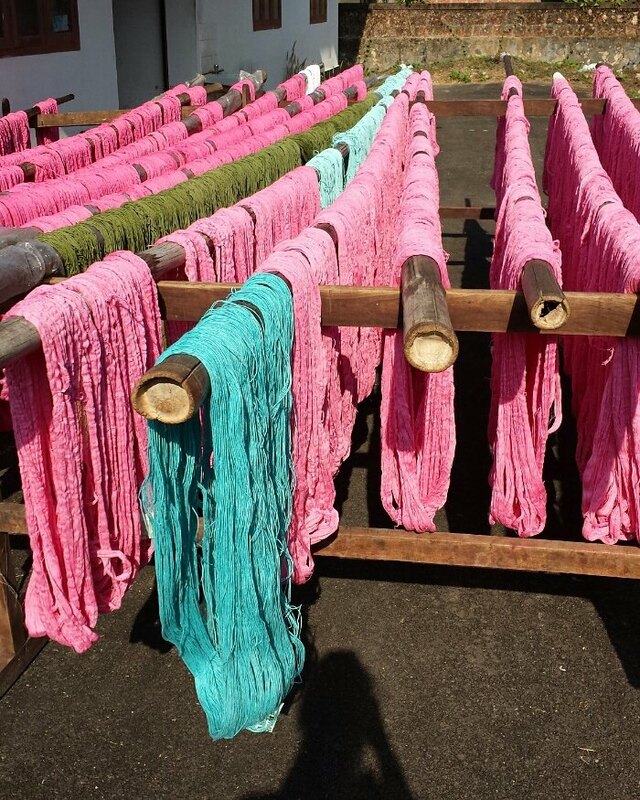 Once the yarn is fully dyed, the workers take the bamboo poles and place them outside. The yarn is then dried in the sun. Any fading that is going to happen will occur here. A few days of thorough drying here. The process takes a little bit longer during the monsoon season. The warp is then hand tied to the looms, and the process of hand weaving begins. Warping can take up to a week per pattern. A weaver will weave an average of 5 metres a day. Once the fabric is woven (totalling 32-36 metres per roll), it is carefully laid out on tables, inspected for any flaws and then finished, cut and packaged in individual sleeves to protect from the environmental elements. Handwoven fabrics, in natural fibres provide much better acoustics than machine woven textiles? This is because of the irregularity in the tension. Machine woven fabrics have a singular, often rigid tension allowing noise to bounce. Because of the irregularity in tension of handwoven fabrics the abrasion can much higher than many of the tests offer. Your sofa covered in a handwoven fabric will fare much better over the years than a sofa covered in a machine woven textile. This is because of the give it will have. It will patina and soften and look more lush over time. The area where our cottons and linens are made receives the first and bulk of the monsoon rains that befall south India. This means that the water used is the cleanest in the country.